Paula Chinick is another amazingly talented writer from the Tri-Valley Area. Writing as P.C. 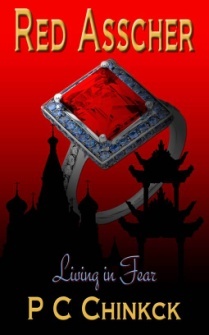 Chinkck, Paula has completed her first novel, Red Asscher~Living In Fear, a spy thriller set in 1943 China. The terror and atrocities experienced by the Chinese at the time of the Japanese Occupation is intense in this too believable novel. A fearful American woman thrown into Japanese occupied Shanghai confronts her tragic past. As the story progresses, murder and treachery find her. Toss in a few spies, add some Communist Chinese intrigue, and the story comes to life. I wasn’t able to put it down once I turned the first page. Paula is working on the second book in the Red Asscher Series, Red Asscher~The Mission. Originally from Seattle, Paula has lived in California for over 25 years. She spent the majority of her career in Information Technology as a project manager working for various Fortune 500 companies. She holds an MBA in International Business from John F. Kennedy University. After the economy collapsed, she decided to retire and pursue her greatest passion – writing. She is the president of California Writers Club Tri-Valley Branch http://www.trivalleywriters.org. Paula has a very interesting Tag Line, one that gives one pause for thought: If you live your life in fear and had the opportunity to change…would you? I, too, have had the privilege to read Red Asscher before its official publication. And, I agree, it’s a page turner. Paula Chinick shows her great talent in everything she writes. I am so involved in the characters from the first novel that I can’t wait for RED ASSCHER, THE MISSION. I can’t give away the ending, but you will love it. Do you know when she plans to release RED ASSCHER, THE MISSION?